Discover vital tips and tricks to get the most out of Progressive Web Apps. Progressive Web Apps (PWAs) are a new frontier in responsive web design, and they're growing in popularity. PWA support started with Chrome on Android, and is now available on most other Android browsers, such as Opera, Firefox, Samsung Internet and UCWeb, as well as iPhones and iPads from iOS 11.3 and Edge for Windows and Chrome on desktop operating systems. To help you create a good user experience for this growing audience, we're going to share some vital tricks and ideas. For more advice, take a look at our article on how to create an app. In 2017, Chrome rolled out a new feature for Android users: WebAPK. Now, when your users install your PWA (if it meets the requirements), a Google Play server will create an APK (Android Package, a native app container) on the fly and install it in the device as if it's coming from the Play Store. Your user doesn't need to enable insecure sources or touch any other settings. When the PWA is installed, it will appear in the home screen, in the app launcher, in Settings and as any other first-class citizen app in the OS, including information on battery and space used in the system. If your PWA doesn't meet all the requirements, the Play service is down, there is a connection issue, or another Android browser such as Firefox or Samsung Internet is being used, a standard shortcut to the home screen will be created. That icon will be browser-branded from Android 8+. WebAPK also enables a nice but dangerous feature you need to be aware of: the PWA will own the domain and path within the boundaries of the Android OS. Based on the scope attribute of your Web App Manifest, every link the user receives to that scope will be forwarded to your full-screen app and not the browser, which means you must pay attention to the URLs you use. Let's say you have a PWA serving mobile users and it's on the root folder of your domain. When the app is installed through WebAPK, the whole domain will now be owned by the PWA. If you have a survey at /survey that you share through Facebook, or a PDF with terms and conditions that you email to your users at /terms.pdf, the OS will open PWA and not the browser when clicking those links. It's essential to check if your PWA routing system knows about those URLs and how to serve them and, if not, to open them in a browser on a different scope. Several browsers invite the user to install your PWA if certain conditions are met, including recurrent visits from that user for your PWA. At the moment, the banner doesn't include enough information for why a user should accept. However, we can use events to avoid the banner and, more importantly, to defer it for something more likely to generate acceptance, such as an install icon. When your PWA is in full-screen mode, there is no URL bar or Share action from the browser for the user to share content with social networks. We can take advantage of the Web Share API and have a fallback to open native social apps. When you have a PWA, you will want to track as many events as possible, so let's take a look at everything we can currently measure. You can use Google Analytics APIs or any other analytic tools to track these events later. The next important tracking event is when the user opens the app from the home screen. That means the user has clicked the app's icon or, on Android with WebAPK support, also clicked on a link pointing to the PWA scope. While many think PWA support is about to land for the first time on iOS 11.3, the truth is that the concept – albeit with a different name – was presented by Steve Jobs more than ten years ago at WWDC 07. That's why iOS supported home screen and offline apps for a while, using legacy techniques. But from iOS 11.3, it will start to support the same specs as Android. Icons on iOS must be square and non-transparent to avoid UI problems. Don't use the same icon you have on Android. Use 120x120 and 180x180 for iPhones. If you have an SPA or you link to other pages on your scope, be careful with navigation, as iOS users don't have a way to go back or forward if you don't provide navigation links within your UI. Swipe gestures don't work on full-screen PWAs. As of the first versions of iOS 11.3, the OS reloads PWAs on every access to the app, so if the user needs to get out of the app to come back later (for example, for a two-way authentication process), remember your app will start from scratch by default. Service workers have a separate life cycle from the PWA window or browser's tab. That's why you can make network operations in the background, even after the user closes the PWA. If there is a pending operation and there is no available network access at that point, the engine will let us process while in the background if a connection is detected later. The Background Sync API is currently only available on some browsers, so you must provide a fallback. The idea is that your PWA will set a flag with a string tag, stating that it needs to do background sync operation. Then, on the ServiceWorker we listen to the event, and if it's the label, we are expecting we return a promise. If the promise is fulfilled, then the operation is flagged as finished. If not it will keep trying later in the background. If your users share your PWA content on social networks, or if they use pseudo-browsers (browsers without their own engine but using web views), you need to be aware of some issues. For example, Facebook uses a WebView inside the Android and iOS apps to offer an in-app browsing experience when the users click on a link. On Android, most of the WebViews don't support service workers and can't install your PWA, so when the user opens your content from Facebook, your PWA will act as if it's a non-compatible browser without any cached files or session details. From iOS 11.3 the WebView will support service workers, but it will be a clone of the same PWA that the user has used in Safari or even in other pseudo-browsers, such as Chrome or Firefox on iOS. Therefore, if you are rendering an installation banner or installation hint dialog explaining the value of installing your app, check if you are within a WebView because the user won't be able to follow your steps. Hide that information or invite the user to open the URL in the default browser. This applies to Facebook on Android, Facebook on iOS, Chrome on iOS and Firefox on iOS, among other apps. Doing a live check if you are on a WebView or not is tricky, but there is a helper tool available. Testing service workers and Web App Manifest requires https, with the exception of localhost. While local desktop testing is fine initially, at one point we want to see our PWAs in action on Android devices. How can we do that? Accessing a dev server from our phone or Android emulator won't work because it's not https and it's not localhost from an Android OS point of view. The solution appears with Chrome Developer Tools. If we go to chrome://inspect and open an emulator or a real device with USB debugging connected, we will be able to enable port forwarding. Then http://localhost on our Android device will be forwarded to our host computer's localhost or any other host. With this trick, Android will render the PWA properly over a non-secure connection. Have in mind, though, that while WebAPK will create the package and install it, it might not work in standalone mode. Google Play Store: At the time of writing, the Trusted Web Activities available on Canary Channel enable you to create an Android app that just opens a PWA you own and distributes it in the Store, creating a similar solution to WebAPK. You can learn more here. Apple App Store: Currently there are no official solutions to distributing PWAs, but WKWebView will support service workers from iOS 11.3, so it won't be difficult to create a simple wrapper for a PWA. The question is, will Apple approve it in the Store? Apple doesn't want solutions that are just websites with a wrapper on it. 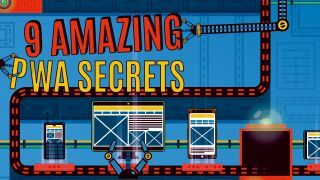 This article was originally published in issue 304 of net, the world's best-selling magazine for web designers and developers. Buy issue 304 here or subscribe here.